“The Poplars” sits on 250 acres of rural land, 35 km from Capertee, located at Glen Davis. This property offers 2 substantial brick newly renovated cottages, with accommodation for up to 8 people. The property encompasses “The Ruins” of the Oil Shale Mine 1932-1952. 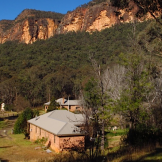 The General Managers Cottage and The Inspectors Cottage lies next to the Wollemi National Park, about 3 hours from Sydney. 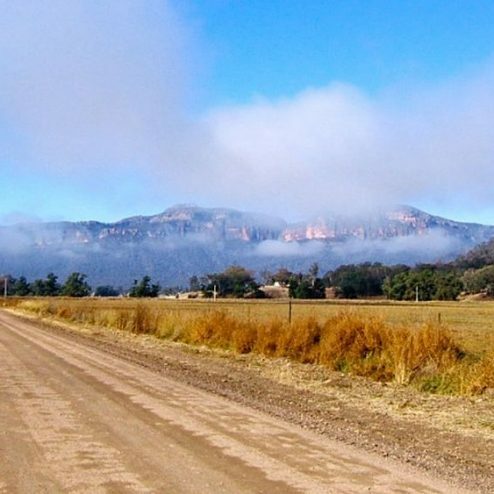 The area is very similar to and part of the same range at the Blue Mountains. The lush valley floor is about 800 feet above sea level and the adjacent mountains are around 2900 feet. 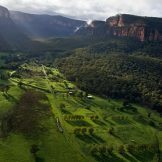 Whilst well known for as a destination for both local and migratory birds, the Capertee Valley is sought after for its natural rock and mountain formations and there are many walks throughout the area including three National Parks which are all close to the cottages at Glen Davis. Most of our visitors in the past 6 years have been avid bird watchers, botanical and fauna lovers, painters, bush walkers as well as historians that want to experience living on one of two of the only existing cottages inside the Glen Davis Oil shale workings. 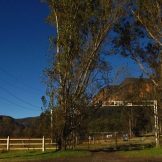 Both cottages have been modernized with new services and furnishing and provide a pleasant and enchanting place to stay at the foot of the Wollemi National Park. Whilst you may view the relics and the old buildings at The Ruined Site within the property, we ask guests to keep to the provided tracks and roads. Every Saturday at 2 pm there is a guided tour of the Glen Davis Ruins for a cost of $15 per person or a family rate.